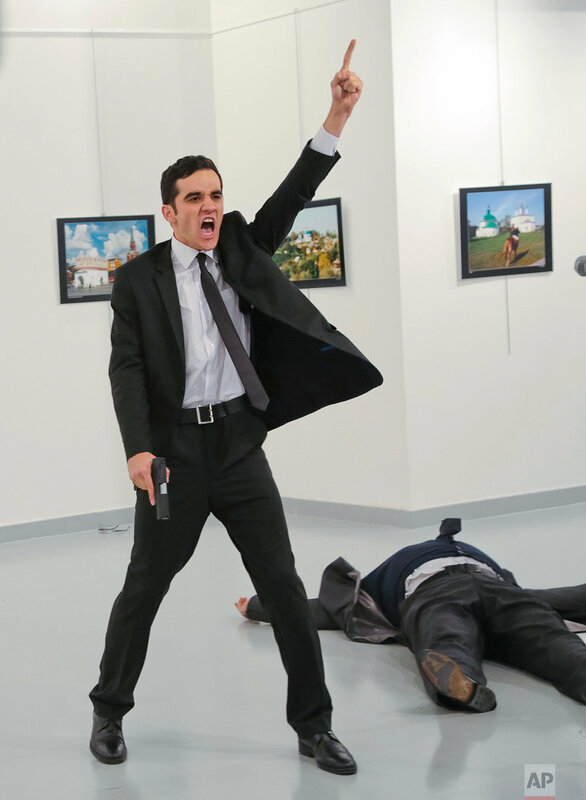 Associated Press photographer Burhan Ozbilici was covering a photo exhibition when a gunman opened fire, assassinating Russia's ambassador to Turkey. Below, he recounts the chaos that unfolded as he captured the scene. "The event was routine enough — the opening of an exhibit of photographs of Russia — so when a man on stage pulled out a gun I was stunned and thought it was a theatrical flourish. Instead, it was a coolly calculated assassination, unfolding in front of me and others who scrambled, terrified, for cover as the trim man with short hair gunned down the Russian ambassador. The exhibition, titled "From Kaliningrad to Kamchatka, from the eyes of travelers" featured photos from Russia's westernmost Baltic region to the Kamchatka Peninsula, in the east. I decided to attend simply because it was on my way home from the Ankara office. When I arrived, the speeches had already begun. After Russian Ambassador Andrei Karlov began to make his address, I moved closer to photograph him, thinking the pictures would come in useful for stories on Turkish-Russian relations. He was speaking softly and — from what I could tell — lovingly about his homeland, stopping occasionally to allow the translator to relay his words in Turkish. I remember thinking how calm and humble he seemed. Then came the gunshots in quick succession, and panic in the audience. The ambassador's body lay on the floor, just meters (yards) away from me. I couldn't see any blood around him; I think he may have been shot in the back. It took me a few seconds to realize what had happened: A man had died in front of me; a life had disappeared before my eyes. I moved back and to the left, while the gunman — later identified as police officer Mevlut Mert Altintas — gestured with his gun at people cowering on the right side of the room. At first, I couldn't figure out what had motivated the shooter. I thought he might be a Chechen militant. But people later said he was shouting about the Syrian city of Aleppo. So he was probably angry about Russian bombardments of Aleppo that were aimed at driving out anti-government rebels. Many civilians have been killed in the fighting. He also shouted "Allahu akbar," but I couldn't understand the rest of what he said in Arabic. I even thought about friends and colleagues who have died while taking photographs in conflict zones over the years. As my mind raced, I saw that the man was agitated — and yet, he was, strangely, in control of himself. He shouted at everyone to stand back. Security guards ordered us to vacate the hall and we left. Ambulances and armored vehicles soon arrived and the police operation was launched. The gunman was later killed in a shootout. When I returned to the office to edit my photos, I was shocked to see that the shooter was actually standing behind the ambassador as he spoke. Like a friend, or a bodyguard." Text from the AP news story, Witness to an assassination: AP photographer captures attack, by Burhan Ozbilici. AP photographer Vincent Yu's "Nine Lives"